Kenwood’s Lo-7D, Onkyo’s PX-100, Sony’s TT-S8000, Technics’ SP10 and Micro Seiki’s DDX-1000 were but five combatants in the race. All direct driven, sporting the (then) new-fangled quartz crystal referenced servo lock to keep the platter spinning with seemingly infinitesimally low levels of speed deviation. Massive main bearings provided vanishingly low rumble, and these decks all sported an enormous and massy plinth to dispense with external vibrations through sheer brute force. Into this fray stepped the Marantz Tt 1000. Launched at the Japanese Audio Fair in October of that year, it sold for the princely sum of Y390,000 (£1,000 in the UK, when the Linn LP12 was £350). A veritable showstopper, it formed the lead component in the company’s new ESOTEC series of ultra high end products, to rival (the more familiar in this country at least) Nakamichi Dragon line. The Tt 1000 was a textbook example of Japanese turntable best practice. The plinth was the basis of its appeal – a chunky 38mm thick laminate of two 15mm glass plates between which sat an 8mm aluminium alloy interlayer. Large diameter Micro Seiki MSB-100 impact absorbing feet, using an ingenious air seal, were deployed to take out any vibes that the 25.3kg unit couldn’t sink by sheer weight and size, and its 3.4kg balanced aluminium platter was topped off by a glass mat. A largish wood veneered box sat beside the Tt 1000, containing the turntable motor’s power supply. Two speeds were available via touch controls on the turntable itself. The massive direct drive motor gave rapid 1.5 second start-up, and superlative speed stability once the quartz lock had kicked in. Early Tt 1000L units came with a Micro Seiki CF-1 tonearm, but Marantz soon offered the Tt 1000 as a motor unit, or as the Tt 1000S with an SME Series III tonearm. 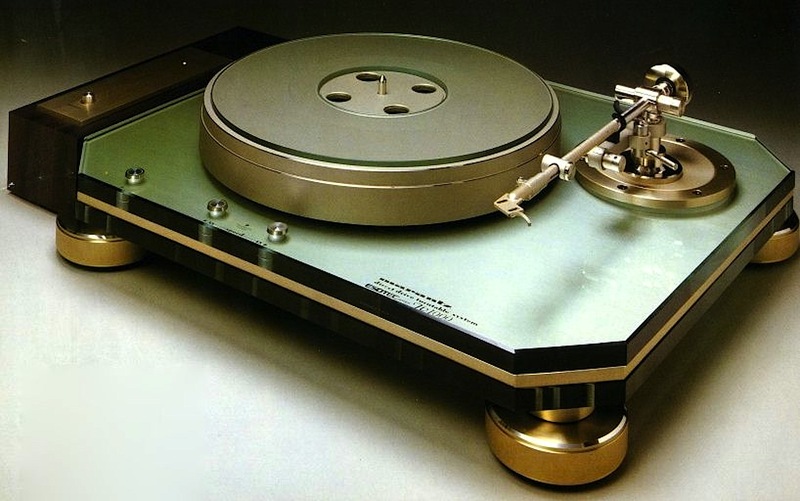 The two-part arm bases were interchangeable with Micro Seiki turntables, but made of aluminium rather than bronze. In some respects, the Tt 1000 was a rip-roaring success. Its build was exquisite (even by the high standards of the opposition), it was an ergonomic triumph (proving extremely simple to use – no parallel tracking tonearms, vacuum platters or disc stabilisers to fiddle with) and its looks were bang-up-to-date yet classically elegant, making the deck seem modern and fresh nearly thirty years later. Sonically however, it was less unequivocally successful. Its strong, powerful and reassured ‘mastertape-like’ sound was in no doubt. Although it wasn’t a Rotweiller with rhythms and microdynamics a la LP12, it had a wider, deeper and more expansive sound with a sense of effortlessness that no belt drive could manage. The (reputedly Micro Seiki) motor was as torquey as a JCB, holding on to the deck’s heavy platter with limpet-like tenacity. Still, some listeners reported a slightly ‘glassy’ tonality, a subtle upper mid hardness, that held the Marantz back in the neutrality stakes. Although counting some famous names amongst its list of owners, the Tt 1000 never really sold well, and it was the cheaper Technics SP10 and SP15 that found their ways into broadcast studios, while Onkyo and Nakamichi rivals went to more ultra high end audiophile buyers. Still, it had a long innings, and it wasn’t until 1990 that it got a replacement in the shape of the Music Link Tt 1000 Mk II, which sold for around 12,000DM in Germany (the deck’s only official European market). These days, you’re going to have to look long and hard to get either variant of the Tt 1000, and you’re very likely to have to look to Germany, or maybe even Hong Kong, the US or Japan to source one if you so desire it. They’re not cheap either – it’s pretty much up to the seller to name his price, and/or for you to tell him how much you’re prepared to pay. Still, the Marantz Tt 1000 is one of the most classically simple, beautiful and superbly engineered turntables yet made – and also sounds, even by the standards of today, sublime. It was a high water mark for Marantz, one of the original and best. we have a Full working Marantz, direct drive turntable system ESOTEC series Tt 1000 with Quartz lock at Home which we are looking to sell. it is located in switzerland. is there any Chance you could Tell me what they sell for or if you have Clients for it? Which model of the Marantz TT1000 do you have ? Is it the 1st or the 2nd edition? Could you send me some photos of it? I remember hearing one at a UK hi-fi show back in the 80s. It was sitting on a stack of about 20 paving slabs to provide it with a solid base. I guess its feet weren’t so good at isolation as was hoped. However, on said stack of slabs it sounded superb! I’ve always loved them since then, though I went down the Nottingham Analog Dais route when I could afford it.